If you backed AirJamz on Kickstarter recently, a Bluetooth packing wristband that allows you to play air guitar with sounds, you'll probably be interested to know that its creators have decided to abandon the wearable form. "While we initially led with the wristband wearable format, extensive focus testing and survey results made it clear that our stretch goal accessory, the AirJamz pick, was more natural and easier to use, especially for kids," Meredith Cannon, associate brand manager at Zivix, the company that's building the AirJamz, told us. "For this reason, we've shifted from a "wearable" to a "holdable" our final retail product, and AirJamz will be sold in the pick format rather than the wristband." The AirJamz appeared on Kickstarter in March this year and comfortably passed its $30,000 pledge goal. 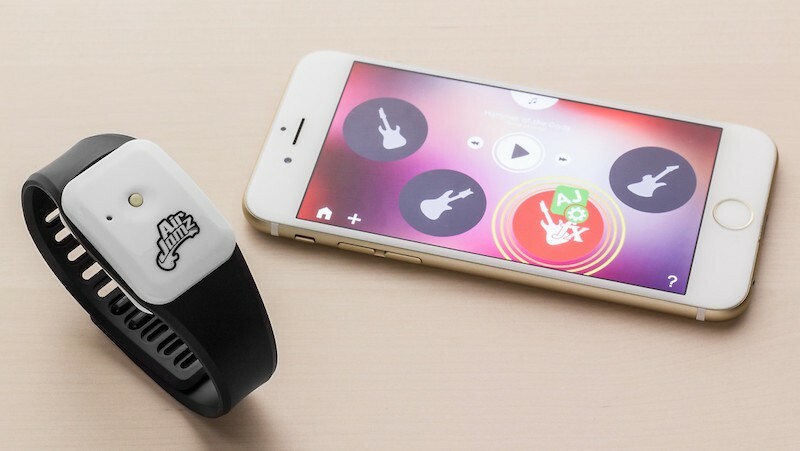 The wristband promised to let you pick a tune from the paired smartphone and app to strum away to. The team had already announced the AirJamz Pick as a surprise gift letting you swap the module out of the wearable. While it's disappointing that Zivix has decided to make such a big design change, it will at least live on in another form. That hasn't always been the case for wearable crowdfunding projects we've covered in the past. One of the most notable examples was AmpStrip, a band aid style fitness tracker which was cancelled after raising more than $500,000 during its Indiegogo campaign. Did you back AirJamz? Are you disappointed that the wearable design has been abandoned? Let us know in the comments section below.